LaDira Chakra candles are infused with scents that relate to each chakra. In the same way that each Chakra has a particular related color, each also has it's own scent and stone. 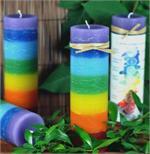 Each candle comes with a description card that tells about that particular Chakra or the rainbow of Chakra colors. 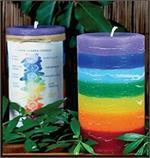 Chakra Candle - 7 layer Pillar 2x6"
Chakra Candle - 7 layer Pillar 3x6"
Nag Champa Pillar Candle 3x3"